I've been craving a delicious lamb shawarma but not the kind you get here... Of course complicated as always. So then what does one settle for? Chicken instead of lamb or beef for starters. Arabian Nights? No thank you. A'la Turka at Select City is probably closest to being authentic, they actually manage to achieve that crisp exterior that the meat gets from vertical roasting. And then there is Zaitoon. I would have entirely skipped writing about it if it wasn't for that little extra. 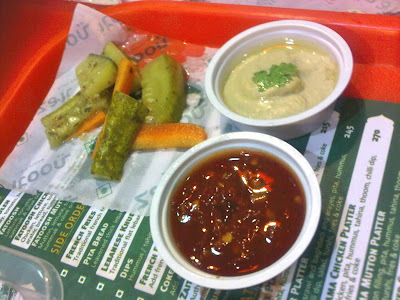 We visited the one in DLF Place's food court. I loved the pickles here. Crunchy, vinegary, herby, yummy! The hot sauce we asked for on the side. We were warned that it was so hot you can see steam rising from it at times. Clearly the cashier was a sucker for dramatics. Chicken Shawarma - Of course, given my lamb craving I could have tried the Mutton Shawarma but I didn't notice any vertical grill with mutton on it. And didn't want pan cooked bits of mutton because ... well because that wouldn't really be a shawarma now would it! We also paid a little extra and got fries added. I was so happy to even have this option because without some nice starchy potatoes to soak up the juices it's just not the same. Next step would be have more wholesome home cut fries but let me not be too demanding! Overall the shawarma was quite tasty and it hit the spot. Not authentic thin slices as you can see . The pita was of the thinner variety which I prefer too. 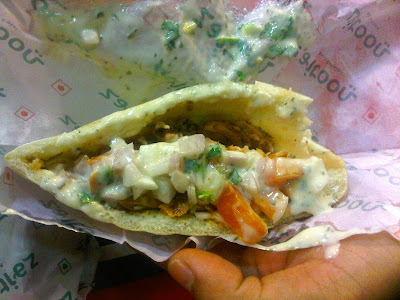 Chicken Pocket Shawarma - Same thing just in a pita pocket. A little too much of that garlic mayo we seem to love here. 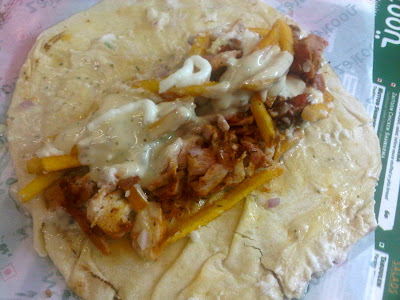 We actually got this first so when we ordered the Shawarma above I asked him to put a little less garlic mayo. Good thing for that too. Hummus Falafel - The hummus as far as I remember was not bad for fast food. It was creamy with a generous dose of olive oil. The falafel on the other hand was a major disappointment . I took a half eaten picture so you can see the not so desirable pale yellow colour. 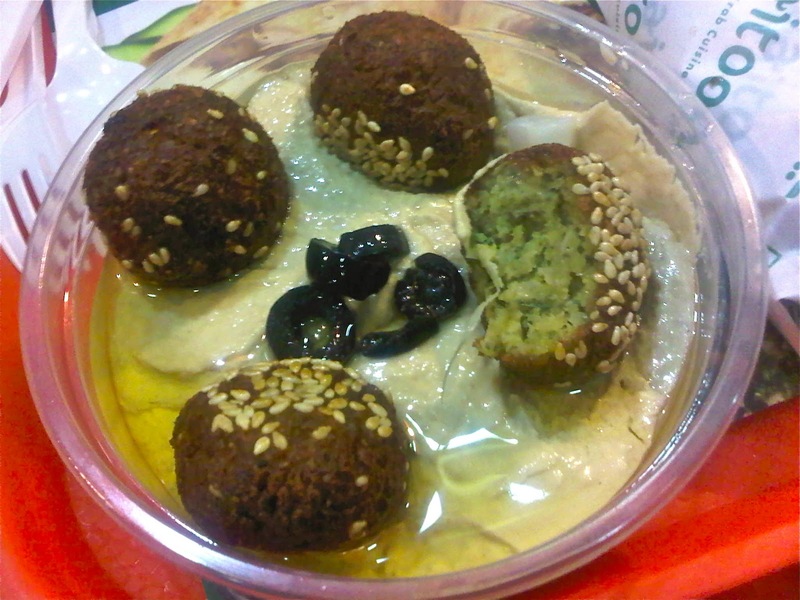 Falafel is essentially a combination of fava bean or chickpeas and parsley and cilantro. A good falafel will have a generous amount of these two herbs giving it a vibrant green colour. Basically I would stay well away from this falafel! Mutton Arayes - So they seem to be a bit confused on the name. As usual our city's menus are full of ambiguous names thrown in with no authentic relation to the actual dish. 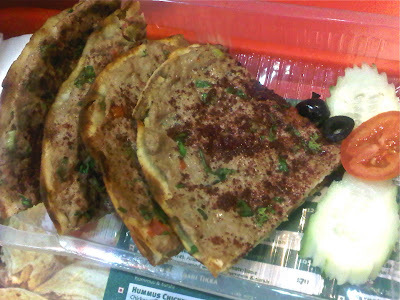 As far as my knowledge goes arayes is pita bread that is stuffed with minced spiced meat and then grilled. This dish is similar but rather than the meat being inside it is on top and then grilled. This dish is actually known as Lahmacun (Turkey), Lahem b’Ajeen (Lebanese) or lahmajoun (Arabic) depending where in the world you are. Now that my little lesson is done with let me add that this was my reason for writing about Zaitoon! I probably ate Lahmacun everyday while I was in Turkey and couldn't believe they had it at this unassuming little fast food stand. The pita was crisp and almost buttery with the generous amounts of olive oil. The ground meat must have been further blended to give it a paste like consistency before it was spread and cooked because it almost one with the pita. The zesty sumac powder on top really made the whole thing come alive. Mmmmm!